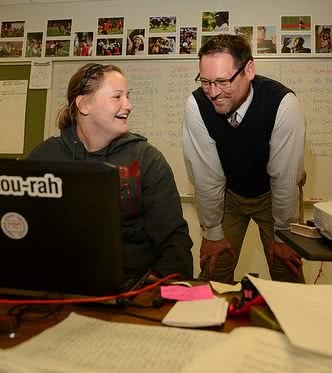 Chris Holmes, 2014-15 Missouri Teacher of the Year, teaches journalism at Hazelwood West High School, where he also serves as a graduation coach in the school’s dropout prevention program. It was supposed to be a day of peer editing, when my advanced journalism students provide thoughtful, in-depth feedback on their classmates’ first drafts. I love these days, when students become teachers and learning flourishes for both writer and editor. But on this particular morning only eight of my 19 students had submitted stories; only five submitted more than one paragraph. It wasn’t as if these particular students weren’t capable; they were some of the brightest kids in the school. Nor was it possible they weren’t given enough time; I provide three, 90-minute classes for research, interviewing and writing. We share a deep, mutual respect, so I don’t believe there was any malice. I was baffled. This wasn’t the first time more than half of my students chose not to do their work. Over the past decade, I’ve noticed it occurring more and more often in all of my classes, in spite of my best efforts at encouragement, motivation and inspiration. And each time they seem genuinely remorseful, acknowledging that they let me down. I sat at my desk pondering what to do. Reprimanding them would be useless. Giving them a pep talk would only temporarily motivate them. I want them to want to learn, not because I said so, but because they recognize the value. Yeah, I know, that’s what all teachers want. But I really wanted it, and I wanted it that day. I needed to find the cause of this academic indifference. So, I decided to just ask. Chasing pavements: trying to achieve something that is destined for failure. I see so many kids who feel this way, their sense of self-worth mopped up from the floor, then twisted, rung out and discarded. Who is to blame – if blame is even the right word – is not my concern. My concern is that students are shoving negative self-perceptions deep down inside and walking around like everything is fine, while sores of mediocrity surface, fester and spread. But a close look at how they view themselves and their “inability” to achieve reveals why they lack motivation. We must invest time in finding the answers and in leading our students to discover answers for themselves. Public schools are incapable of solving problems that stem from poverty, abuse or illness. But we have the opportunity to address motivation, or the lack thereof, by teaching our students the belief in one’s ability to reach goals. I don’t mean just mentioning it one day; I mean actually embedding it into the curriculum, or at least into a consistent conversation. We expect our high school graduates to know how to write a five-paragraph essay, how to describe photosynthesis, how to solve for x, and a slew of other important skills. We should also send them into the world knowing the importance of positive self-efficacy, and how to develop and maintain it. If we could move their motivation needle just 10%, imagine what that would do for them personally, let alone what it would do for test scores, career readiness and producing a school newspaper.